Christian Johansson was a teacher, choreographer and coaching balletmaster for the Russian Imperial Ballet. 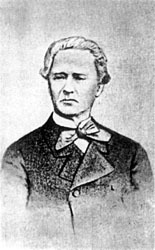 Born Pehr Christian Johansson in Stockholm, Sweden on June 1, 1817, he moved to Russia as a dancer and stayed on as one of the most important teachers in Russian history. He is remembered in Russia as exemplifying the artistic beauty of the male dancer.